Handcrafted from reclaimed "Bourbon" barrel wood and distressed reclaimed oak. The One & Only "Celebration Box" has found it's place as the perfect gift for the guy (or gal) that has everything! Includes: decorative hardware, Spanish cedar lined cigar humidor insert, 4-shot glasses, & last but not least, room for your favorite celebratory libation. Finished to seal the interior barrel wood's charred patina, a unique process preserves the remnants of the barrel's past life of aging fine bourbon! Any chance this could get to New Zealand within 2 weeks? BEST ANSWER: Hi sorry we do not ship these internationally. I ordered the Celebration Box about 3 months ago because when I saw it online, I knew it would be he perfect gift for my son. His birthday was yesterday and he was not only surprised about this unique gift but he kept looking at it several times throughout the day. 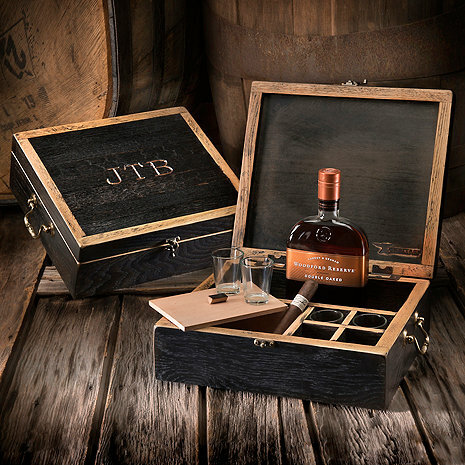 The Celebration Box is very nicely crafted with wood from old barrels. The Monogram came out perfect and the packaging was as solid as it can get. If you are looking for a special gift, this Celebration Box is it.